Photo: Impact of no irrigation on alfalfa during summertime. However, due to alfalfa’s resilience to drought, yield will recover once the field receives water the following winter. The recent rains were a welcome relief for many parts of our state, but we are still in a serious drought with our reservoirs and snowpack at historical low levels. Ensuring adequate water for crops will be a challenge this year. In general, perennial crops, such as orchards and vineyards, cannot survive extended periods without irrigation. However, alfalfa is more resilient because it can go into a drought-induced dormancy over the summertime, at least for one year. The tradeoff is that without water there will be little yield, but research has shown that the stand will persist on most soil types and yield will recover the next year once water is applied to the field again. If trends continue as per current predictions, the continued drought in California will have serious impacts to forage production in 2014, affecting the availability and price of animal feed. It’s like an 800-pound gorilla in the room, worrying everyone including growers, suppliers, livestock operators and consumers alike. 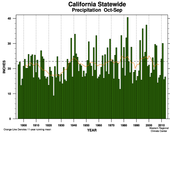 According to the Western Regional Climate Center, October-December of 2013 was the driest on record in California. Other western states are also experiencing drought to varying degrees (note the U.S. Drought monitor map for the west below). Current predictions are for zero to slight chances of rainfall for the rest of January for most of California.